I watched The French Connection for the first time this week, and it was every bit as good as its reputation. OK, you already know how good it is, but what makes it stick out more than forty years later, other than fine performances by Gene Hackman and some of his supporting cast? 1) It's subtle, at times, for an action movie, no more so than when Hackman's "Popeye" Doyle engages in an arguably foolhardy action in the film's climactic scene. Any number of inferior TV and movie successors would have hit us over the head with the conflict of it all: a colleague trying to talk Doyle out of what he is about to do, or reaction shots of the colleagues shaking their heads after Doyle does it anyway, or both. Director William Friedkin just lets Hackman do his thing--a crowded scene, and then a fast cut to Hackman alone. It's a breathtaking moment, my favorite of the movie. may have peaked with The French Connection. 2) The absence of hub-bub and police sirens as Doyle chases the sniper who had tried to kill him. (Doyle got down from the building's roof too quickly to have been able to follow the shooter so closely, a minor continuity problem that ought to hamper no one's enjoyment of the movie.) Quiet--I mean, regular, realistic quiet, not breathing or the sound of running feet, obtrusively over-amplified against a background of silence--can work a hell of a lot better than noise. 3) How much of that quiet was Friedkin's choice, and how much was due to the absence of cellphones in 1971? In 2014, Doyle would probably have called in police reinforcements before or during the chase of the sniper, which might have meant sirens and hub-bub. What was the last classic movie you got around to seeing only years after everyone else had seen it already? How did it compare with its reputation? I just watched Rififi two nights ago for the first time. Don't know why it took me so long, but. . .
A really engrossing film. It thought it deserved its reputation. I will probably watch it again sometime in the future, and I think I will start watching more caper films in the future. I just watched Friedkin's Sorcerer (1977), a remake of the The Wages of Fear. Stick with the original. Sorcerer is bloated and clumsy and mostly dull. The Seven-Ups is, indeed, an unofficial sequel and is pretty damn good. 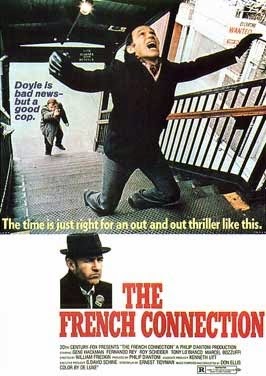 French Connection 2 is also very good and features a foot chase instead of cars. It also has a great ending. And speaking of '70s heist films, check out The Anderson Tapes with Sean Connery and Christoper Walken's first film role. Peter, let me somewhat alter your question: "What movie (based on a book) did you see that was great until you later read the even greater book?" My answer: The Maltese Falcon. Yes, the movie (Bogart version) was superb (but of course I did not see it when it was first release), but when I later read the book (after seeing the movie several times over several years), I realized that the book was even better. Well, forgive me for altering your question, but when I began thinking about movies -- in response to your question -- I could not escape thinking about The Maltese Falcon. So, for better or worse, there you have my somewhat tarnished two cents worth. Cary, I agree. I have watched both Wages of Fear and Sorcerer and the original is so superior that there is no comparison. I will watch it again but have no intention of watching Sorcerer again. Once was once too often. Ali: I see that "The French Connection"'s producer directed "The Seven-Ups," so that would lead me to expect continuity. Roy Scheider was so good in a supporting role in "The French Connection"; it will be interesting to see how he handles a leading role so relatively soon afterward. He handles both jobs well, and I say there's was an actor who knew what he was doing. Fred, I was underwhelmed the first time I watched "Rififi," possible because I have long been a fan of "Big Deal on Madonna Street," which is probably one of the view spoofs better than the movies it makes fun of. I came to caper movies through Richard Stark/Donald Westlake's Parker and Dortmunder novels. I probably ought to track down "Rififi" again to see what I might have missed. French Connection 2 is also very good and features a foot chase instead of cars. It also has a great ending. And speaking of '70s heist films, check out The Anderson Tapes with Sean Connery and Christoper Walken's first film role. Cary, it's good to hear that a movie with such an uninspiring title as "French Connection II" is worth seeing; thanks. "The French Connection" also includes a foot chase, don't forget. I will be sire to compare the two. R.T., the other example of a superb movie that turned out to have been based on an even better book is Get Carter, by Ted Lewis (originally published as Jack’s Return Home). I put The French Connection on my Netflix list just a couple of days ago when Slate mentioned that it was one Netflix was adding back into their list. I did see it a long time ago, I think at the drive-in with my family, which tells you something about HOW long ago. Big Deal on Little Madonna Street was the one I was going to mention as one I saw just recently, but I've yet to see Rififi. And I really enjoyed it, spoof or not. Get Carter was another one I only saw a couple of years ago. Adrian, sounds as if that might also be a reference to the foot chase and the train scene in the first movie. Meanwhile, this discussion has added two movies to my list. a good thing. Seana, I had just happened to notice The French Connection when I opened the Netflix page. I suppose heavy promotion accompanies its (re)introduction to the catalogue. I, too, remember the ballyhoo surrounding The French Connection's original release. I don't remember why I did not see it at the time. Big Deal on Madonna Street is more than a mere spoof for at least three reasons: the cast was exceedingly talented and attractive, the characters are interesting, and the heist, while played for laughs, is also as elaborately planned and as punctuated by tension as would be the case in any "serious" heist movie. I think I liked it pretty well, but I wasn't the big Gene Hackman fan that others in my family were. Or maybe I was--it's all a bit murky now. I definitely don't remember the plot. Maybe I didn't understand it. The plot? Drugs + Money + Guns. Alain Charnier (Fernando Rey) spots Doyle tailing him (He sees Doyle reflected in a window), all he does is give a barely perceptible smirk, There's no cutaway to Doyle, and Friedkin does not show us what Charnier sees--we don't get a shot of Doyle reflected in the window. Friedkin, that is, lets the viewer know what has happened without, however, hitting him or her over the head. As the movie did in its climactic scene, it respects the viewers' intelligence, and I like that. Oh wait yeah cd be the first movie. Adrian, the foot chase in first movie happens after Hackman finds the sniper's gun on the roof, sees him in the street running, then charges back down to street level to chase him (As I mentioned in the post, no way Hackman could have got back down the fast. It's a small continuity error.) Does that jog your memory? That is a great story and if your brother is barred for security reasons from repeating it, I hope you will put it to good use in a book or a blog post. 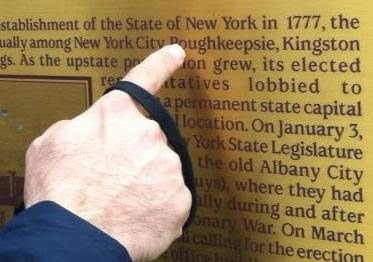 I've always wondered how one says, "Do you still pick your feet in Poughkeepsie?" in Pashto. I'm surprised that technique hasn't found its way into one of Adrian's novels. I do have a couple of friends from Poughkeepsie, one of whom I may even see tomorrow and if I do I'm going to tell her that story. Better make sure your friend has not signed the Official Secrets Act. I like the alliteration of "Pashto" and "pick your feet in Poughkeepsie," too. Thats why he says he cd never write a memoir because all the really interesting stuff is covered by the Official Secrets Act. Picking your feet in Poughkeepsie in Pashto will have to do until the interesting stuff comes along. What are the parameters of the Official Secrets Act? Are all soldiers covered, or does one have to sign the act? What is he, or other other military personnel, allowed and not allowed to reveal? Cool news re Robotham. And he's more than a legend; I've met the guy. It makes sense to bar personnel from revealing operational details. I half-expected you to tell me that revealing what the Official Secrets Act forbids constitutes a breach of the Official Secrets Act. Does the act bar revelations after one leaves the service? Does it have a time limit? OK, I can look that stuff up myself. I just dont know the answer. I wd have lasted 1 day in the army I reckon. As soon as that guy started shouting at me an inch from my face I wd have had enough. The obstacle course and the guns I wd have enjoyed but I cd not have coped with that awful shouting. I would have been booted out before the first saliva hit you in the face because I'd have asked, or tried to ask, too many questions. I would have been booted out for sheer laziness. Somehow both my parents survived boot camp, but I really don't know how. They certainly weren't the gung ho types. Not that I'd want to encourage your brother to get into trouble, but it does seem like any kind of official secrecy is getting breached all the time these days. Like maybe we somehow don't believe in it as much anymore. Or maybe its just the means to do it is more available. Seana: They're playing your song. Thanks, Peter. I think there's a reason most people are recruited at around 18 or so, because I don't think people a whole lot older than that would put up with it. My mom wasn't much of taskmaster when it came to getting us to do chores, but we did all learn to make beds with hospital corners, which was something she learned in the military. I don't think I have ever even aspired to make the sheets so tight that you could bounce a coin off them , though. Regarding being shouted at in military boot camp, although no one today or earier in my youth would raise their voice to me without a fight - I'm a South Philly guy and a former middle weight boxer - the shouting and orders in Navy boot camp were designed to make a bunch of dopey civilians react fast to emergenices and act as a team. Most of us knew this and didn't react too badly to the drill instructor's shouts and seemingly odd instructions. And having grown up in a household with a former WWII UDT frogman Navy chief father, I was not bothered that much by the Navy chiefs barking orders at me in boot camp. Considering the U.S.' (and the U.K's )combat records in the wars of this and the last century, the military most be doing something right in basic training. Shout on! As for "The French Connection," one of my favorite films, I interviewed Randy Jurgensen, one of the NYPD detectives who served as the director's tech advisor and also appeared in the film. He was the police officer who dealt with the French TV personality over the missing car (with the the drugs). When the Frenchmen got on his high horse, Randy calmly responded that there was no smoking in the garage. Randy also appeared in the final raid. Randy told me that he jumped on Billy Friedkin about Gene Hackman shooting the French criminal in the back after the car and elevated chase. "No cop would shoot a guy in the back," Randy said. "That's murder." The director brushed Randy off and said don't worry about it. Randy said he was suprised when he heard the roars of approval and clapping when the film goers saw the shooting. Paul, Randy Jurgensen handled that brief appearance with great aplomb; I enjoyed the way he delivered that "no smoking" line. Is your interview with him available? I'd be interested in any discussion of Hackman's shooting the French sniper in the back. I wonder what Friedkin had in mind when he brushed off Jurgensen's complaint. That Popeye Doyle was supposed to be a loose cannon and a rogue? That would be interesting, since Eddie Egan, on whom Doyle is said to have been based, was also a technical adviser on the movie. Would Friedkin have said Doyle was exhausted, dazed and wounded after the chase and that his aim, his judgment, or both were impaired? Or would he have just said the shooting in the back was dramatic license. As it happens, the few people I've known who served in the military have tended to be be quiet sorts, at least when I knew them, including the ex-Navy guy who laying out pages for one section of my newspaper this evening. And "seemingly odd instructions" reminds me of seemingly odd questions, like "Do you still pick your feet in Poughkeepsie?" Seana, the military was much less a part of my youthful frame of reference than it probably was for many Americans of my age. Perhaps it's no coincidence that I can't make a bed worth a damn. I think it was quite a different era of military service, because a lot of people served who wouldn't have signed up even by the time I was in high school. It was a way to see the world and to get an education as much as anything. My dad and his brothers all signed up, but I think my oldest uncle was the only one to see combat. And I think because the military wasn't so much a path as an interlude for a lot of these people, it kind of fell away from them once they were out and on to other aspects of their life. As for my mom, it was kind of a fluke that she was in the military at all, because not very women were at that point. Seana, I suspect that is the case with most people I know who served, that service was an interlude for them. And I just remembered a former housemate a couple of years older than I am who been in an Army band at Fort Sill, was in art school with the aim of becoming a cartoonist, had traveled across country from Washington State to Massachusetts. The only ex-military person I have known who fit any military stereotypes was a public figure in the city I covered on my first newspaper job. He had been a drill sergeant, and he acted like it. I've not yet posted my interview with Randy Jurgensen. I'll send you a link to the Q & A when I do. Ah, so it's a recent interview? Thanks. This all suggests a different question: what is the best book to movie conversion of all time? In crime fiction, The Maltese Falcon and Get Carter come to mind. I'd put To Kill a Mockingbird way up there on that list. Seana, was my comment a subliminal suggestion for your comment? Note: I am NOT that Harper. I suspect others would, as well. I have neither read the book nor seen the movie, which probably makes a me part of a smallish minority. I have always like the sound of the bird species "finch." I don't know why that occurred to me just now. Too much time on my hands, I guess. I should probably go do something useful, like clean my attic. That's funny, Harper. It may have been a factor, although I did not think you were that Harper. Peter, I think both the book and the movie are near perfect things. The book had its fiftieth anniversary in 2010 and the Bookshop did a big event for it, and I reread it then. It definitely held up. I haven't seen the whole movie in many years, but I have seen large portions of it. Peter, Seana, et al: May I request the favor of your visit to my new blog, Harper's Pond, especially as I am eager to get the blog rolling (so to speak), and I would like to have reading recommendations from the distinguished host and visitors at DBB. Thank you in advance for your visit. How do we get there, Harper? Seana, I remember that anniversary. Was there some talk around that time that Harper Lee was going to write or publish a new book? I also remember some poll or panel deciding some years ago that Gregory Peck's Atticus Finch was the most admirable hero in all of movies. Peter and Seana, do you know the legend/myth/BS that Truman Capote actually wrote the novel for Harper Lee? Harper, here is that link in handy, one-click form, http://harperspond.blogspot.com/, straight from the busy streets of Southeastern Pennsylvania. THanks! I'm sorry that I botched my attempt. Harper: I have heard that myth. I am inclined by temperament not to believe such things. But then, I am naïve enough to believe that Shakespeare wrote Shakespeare’s plays. I haven’t read all of it or listened to any of it yet, but you might find this discussion of the Lee-Capote rumor interesting. Harper, thanks, I checked out the blog. I'm interested to see where you go with it. I didn't hear any rumors about a new book, but there were a couple of new biographies that came out at the time. And that was when I first heard the written by Truman Capote rumor. Didn't know if I wanted to mention it to give it any further legitimacy. I obviously have no idea of the truth of the matter, but it certainly seems to be her sensibility, rather than Capote's. It is extraordinary that two such gifted writers should happen to live next door to each other at a point in childhood and remain friends in adulthood as well. I didn't learn that the Dill of To Kill a Mockingbird was based on Truman Capote till I saw the movie about Capote with Philip Seymour Hoffman. I was astonished at the time. I tried the links to your blog, but I keep getting a message that you have moved.